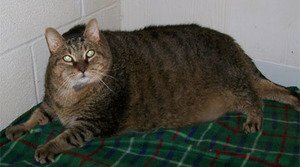 Yesterday, CatTime.com reported on the sad death of Meow, a 39-pound cat that was on a diet to lose weight. The 5-year-old cat passed away on Saturday from pulmonary failure. Tiny Tim weighed almost 36 pounds when he was found on the street last Christmas. Those who followed Meow’s progress may be interested in another cat with a similar weight condition. Meet Tiny Tim, an 8-year-old obese tabby cat that was rescued from the streets of Houston, Texas. Tiny weighed almost 36 pounds when he was brought to the Southside Place Animal Clinic last December; since then, he has lost almost four pounds. Despite an aggressive campaign to find the cat’s owner, no one has stepped forward to claim the animal. Shelter personnel do not believe Tiny was a stray. Tim does not have diabetes, but he does suffer from arthritis and has mobility issues. Tim works out five to six days each week. His regimen includes walking the length of the clinic and a reduced-calorie diet. Personnel estimate it could take up to two years for the feline to lose the weight required to be considered “healthy,” but warn that trying to get a cat of Tim’s weight to lose too much weight too fast could result in liver failure. You can see more of Tiny Tim on his Facebook page or at his special page on the Southside Place Animal Hospital website.